Celebrate Always: happy mothers day! Who's the one who always comes through in the clutch? MOM is! We saw this clutch on MADE and thought it was so cute and would be perfect for our moms to carry in their purse. 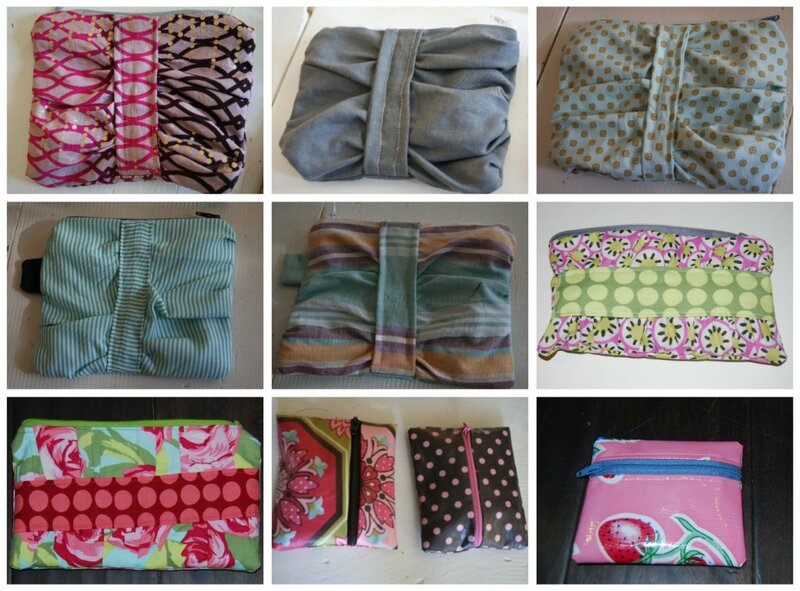 The clutches turned out so cute and we love them! They are perfect for our huge purses that we carry but we thought maybe a little big for our moms to put in theirs. So we then made these oilcloth coin purses from freshly picked. They are the perfect size to carry in your purse and were so easy to make. We sent one of each to our wonderful moms and mother in laws. I filled the clutch with some pedicure supplies and put a gift card in the coin purse. We love our moms (Jo & Kathy) and mother-in-laws (Dawn & Jan) and wish all of you the happiest mother's day! We are truly blessed with the most wonderful and caring moms in our life and we are so thankful for everything you do and teach us in life. It's crazy how much your love and respect grow for your own mom once you become a mom yourself. There are so many moments where we stop and realize just how wonderful mom is. We love you and hope you have a wonderful mother's day! If I (Allison) ever need a cooking question I know that my multi talented mother-in-law Dawn will come through in the clutch for me. She could start her own business in the kitchen, she is amazing! Everything she makes is the best. She is just the sweetest. Not only does she know all the tricks to cooking but she's got it down when it comes to kids too. She raised 3 precious boys and always has the best parenting tips and advice. She is such a wonderful Mamie to Ella and I am so thankful for my amazing mother-in-law and all the things I learn from her. My mom (Jo) always comes through in the clutch for me when it comes to pretty much anything creative and stylish. Even though we don't have similar tastes in wardrobe or house decor she can still give me the best advice on something. She's the one I call before I am going to a wedding and don't know what shoes and accessories go together. If I see something I like in a store I will send a picture of it to her and see what she thinks. Her opinion means a lot to me and in the end it's like what they always say..."moms always right." So many times I have gone against what she says and wished I hadn't:) Thanks so much mom for all your inspiration and advice in so many things in life. Your always there for me and are the best Jo Jo to Ella. Thank you for being such an amazing mom, I love you so much mom. I (kristen) have the most wonderful mother in law!! she always come through in a clutch with almost everything!! she is amazing at home decorating ( i mean, look at her blog!! she is sooo talented! ), cooking, and really just creating anything. she is just such a wonderful person and i think that she has helped me realize some of the things that i love that i never knew about. i never knew how much i loved decorating a house until i met her; now i def consider it one of my favorite things. i love to call her when i have a new paint color and she has helped me so much with my sewing, too. she is just the most wonderful mother, mother in law, grandmother and friend and i am so thankful for her! hope everyone has a great weekend and happy mothers day! Well of course I agree about the mom's. I know all 4 and each is an incredible woman, unique and special as God made them, but all share a steadfast love that make all their kids, and grandkids feel loved and secured. Our lives are very full and blessed. Not mentioned is the greatness of A and K. All the blog stalkers can see these women are a blast, creative, caring, and infinitely loving of their kids and husbands. What you don't know is btwn blog posts it doesn't stop. Its not an act - they are in constant motion loving Avery, Ben, Sawyer, and Ella with a ferociousness (sorry, guys don't write like girls) and they fill their children's days with adventure, learning, and care. At night their homes are filled with warmth, great cooking, and yes occasionally a craft/sewing mess. We love them and hope today is as special for them as the other 364 are for us each year. That is the best way to end a Mother's Day....a blessing from one of the biggest blessings in my life! I LOVE my clutch and hope you got the picture of it already filled up and in my purse! And to include Sarah and Grandma....you are the sweetest! Your mom has taught you well and passed on so much. Thanks for the blessing Kristen...I love you! Bob Booth, so sweet! I believe every word he says too! You cant always say this cause if I remember correctly, he's quite the jokester, but this I I believe whole heartedly. Those 4 kiddos are so lucky. We love reading about all the adventures! Happy mother's day friends. Love these clutches and coin purses! But, not as much as I love you guys! I totally agree with Bob and love that he gave you the shout out. So sweet! I love all your moms dearly and am thrilled to know them all and feel blessed to learn from them and from you. Happy Mother's Day! Thank you so much for this blog- it inspires me (& my crazy fun friends) everyday. You guys are like party planning guru celebrities to a group of stay at home moms here in oklahoma =) This is the ONE blog I can't get enough of & as soon as I find the cord to my camera I have over 100 pictures to upload of our Lullabylubbock craft night =) We made so many cute things & planned more themed parties- our husbands are even excited about this! Every Sunday night of the summer we're having a themed dinner at our house. I think Ellen should have you 2 on her next mothers day show because you guys are so awesome & inspire so many more people than I think you know =) Happy Mothers Day to both of you!!!! Happy Mothers Day to 2 of the most creative, fun, selfless, loving, awesome moms I know! Bob summed it up pretty well...you girls amaze me with your patience and energy. Those are some lucky kiddos!